(3:20 p.m.EST) -- With Symphony of the Seas just days away from arriving in Miami after its inaugural season in Europe, Royal Caribbean has unveiled where the new ship will call home. 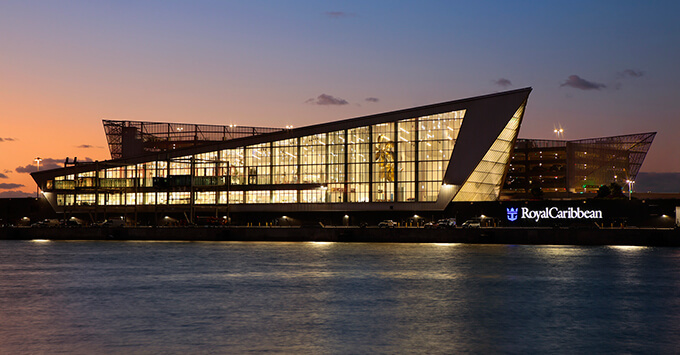 PortMiami's new Terminal A -- reportedly the largest cruise terminal in the U.S. based on passenger numbers -- will make way for the first Oasis-class cruise ships to ever be based in Miami. (The port was previously unable to accommodate the 5,500-plus-passenger ships.) It also will provide what the line calls a "frictionless boarding process," through technology like facial recognition that will expedite the embarkation process, and a faster luggage transportation system. "When you look at the ships we've been building, and the design sensibility, and the way we manage space, and the way we create experiences -- the natural extension of that would be the boarding experience … particularly in our major homeports," Royal Caribbean's president and CEO, Michael Bayley, told Cruise Critic. "Technology plays a huge part in our everyday existence, and so you need to start building the technology into the experience. If you think about it, it's happening everywhere. It's happening with the airlines, it's happing with the cruise lines; it's an inevitable journey we're all on, and we obviously want to be the innovators at the front of that." The terminal's most buzzworthy technology is its facial recognition. Cruisers now have the ability to upload a selfie with their passport information, which allows Customs and Border Patrol to expedite their process by eliminating additional screening time. Royal Caribbean aims to trim down the boarding time to about 10 minutes; a total of eight minutes -- from portside to the ship -- was achieved during a test run with Mariner of the Seas' passengers. In addition to improving the passenger experience, Terminal A boasts a sleek, modern design inside and out -- reflecting the work of Singaporean architectural firm, Broadway Malayan. 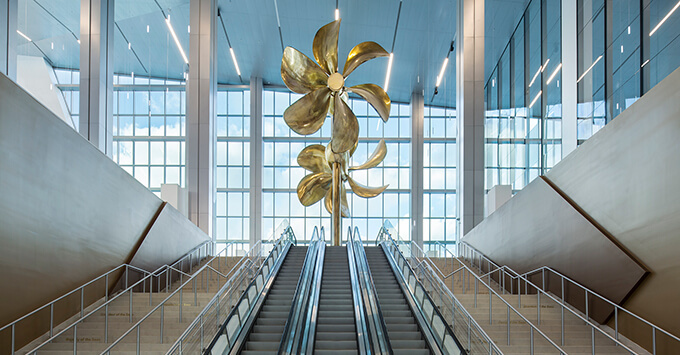 Indoors, 30-foot-high ceilings and walls of windows flood the space with natural light, while all eyes are drawn toward two massive golden propeller blades rotating in the air, on the second level. The $250 million terminal, part of an ongoing partnership between Royal Caribbean and Miami-Dade County, is expected to welcome 2 million cruise passengers per year (up from 750,000 passengers) including those using Terminal G. PortMiami's Terminal G is shared by Royal Caribbean and sister brand Celebrity Cruises, but is unable to accommodate Oasis Class-sized ships. As for future investments, Bayley told Cruise Critic that more projects associated with terminals in key ports will be revealed in the near future. 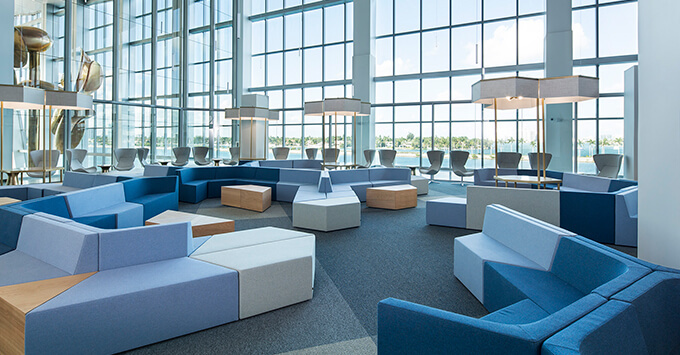 Meanwhile, Celebrity Cruises is on the brink of unveiling its new Terminal 25 in Fort Lauderdale's Port Everglades, ahead of Celebrity Edge's launch. Royal Caribbean's newest ship, Symphony of the Seas, departed from Barcelona on October 28 and is expected to arrive in Miami on November 9. Allure of the Seas docked at Terminal A today, marking the port's first Oasis-class ship, while Oasis of the Seas will begin sailing from Miami in 2019. Cruise Critic will be onboard Symphony of the Seas for its official naming ceremony on November 15. Stay tuned for our live coverage.